As I watch the various online cloud services gather, one of the things that I notice is that many of them want to funnel you toward a specific workflow. One of the reasons why I like Dropbox, is that it works on any of my devices, all of my platforms, and with practically any type of file. Carousel (the visual Dropbox companion app) running on my iPad mini. I like that I don't have to worry about what type of machine I'm using. I have my account set up on both Mac and Windows computers, iOS and Android devices. I also like that it's equally adept at backing up my work, and sharing it with others. Again I have complete control over the process. A big jump forward for me as a photographer was when Carousel was added to the mix. 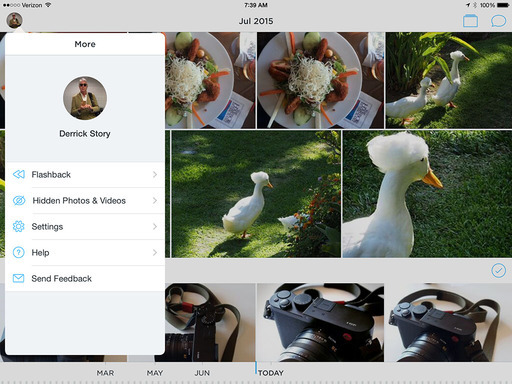 This companion app for Dropbox provides a photographer-friendly front end to the service. I use Carousel to view, organize, and share my images on both my mobile devices and computers. I've recorded a short movie that explains more about why I think Dropbox is an excellent match for photographers. You can watch it right here. And if you want to learn the ins and outs of Dropbox's features, take a look at my lynda.com title, Dropbox for Photographers.